As the popularity of using large timbers continues to grow, many builders and customers are wondering how to properly care for these impressive yet daunting structural elements. Of particular concern are the cracks and checks that often form along the surface of large timbers. How can cracks and checks be prevented? With careful vacuum kiln drying, timbers kept indoors and out of direct sunlight could potentially remain check and crack-free. As long as the temperature and moisture levels remain constant. And there are no earthquakes or major disruptions. Or shifts in barometric pressure. Or . . . you get the idea. It’s not entirely impossible, but neither is it very probable. Because of the natural properties of wood and the sizes of structural timbers, checking and cracking is simply part of the deal. In 4/4, 8/4, or even some 10/4 lumber, it can be avoided with careful drying techniques. But thicker pieces starting with 12/4 sizes represent significant cross sections of logs, meaning that the wood will respond more like a log than a sawn board. When you get into the 6×6 or 12×12 sizes, the issue is even more significant. Because there’s so much wood surrounding the center of a timber, it remains insulated, retaining moisture long after the outer layers have dried. As those outer layers dry, they begin to shrink, but their natural movement is resisted by the inner layer, which is still moist. The only way to cope, as it were, is to crack. The cracking is not cause for concern; however, if you have a large timber that does not exhibit any cracks, you should be worried: it could be a sign of a rotten core. Just as each species moves in its own unique way, each species checks in a predictable way. 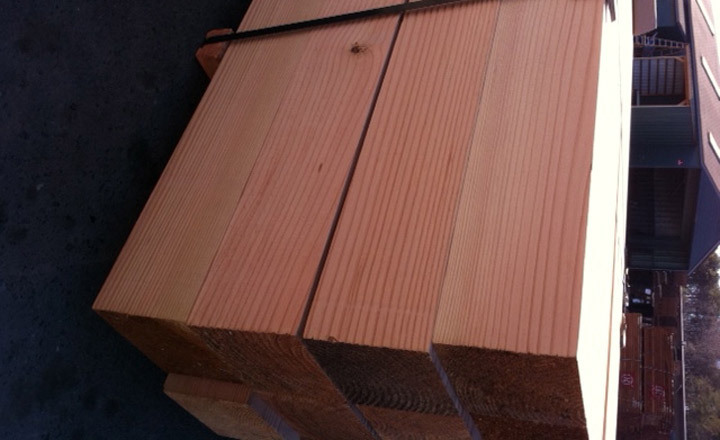 Heavy species, such as Ipe, that have high density, check more easily than species such as Douglas Fir. The reason is that when there is less empty space into which the wood fibers can compress, checks open quickly. In the case of Ipe, in particular, though, the species is stable enough to keep the cracks relatively small. There will be more of them, but they will typically be very shallow. In Fir, however, when checks finally occur, they tend to be quite deep and wide, appearing similar to explosive cracks, because as the timber has compressed into the empty spaces, pressure builds up. When the fibers finally give way, the result is more extreme.